What a week it's been! There's nothing I love more on Friday evening than coming home, settling in on the couch for trash TV, and knowing that for the next two days I don't have to wear "real" clothes (except for church on Sunday). 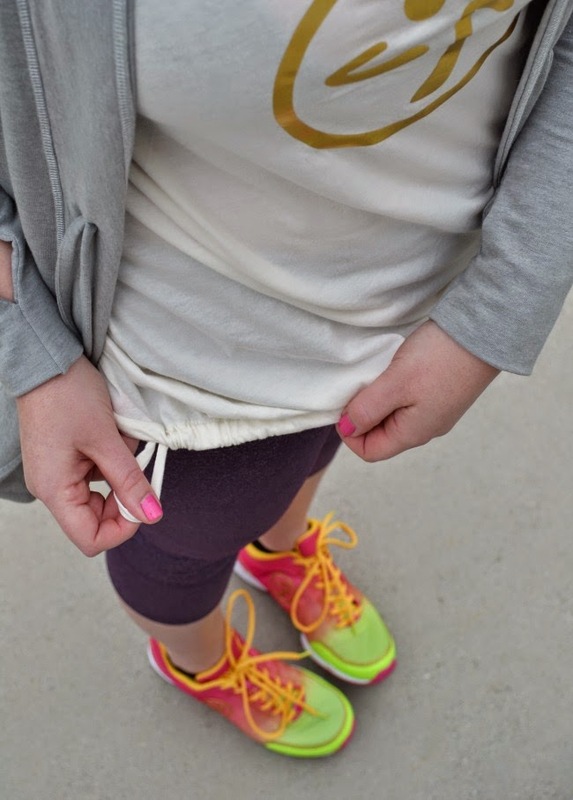 Since starting my collaboration with Zumba apparel, I've discovered that it is possible to look put-together for weekend workouts and errands without much effort at all. 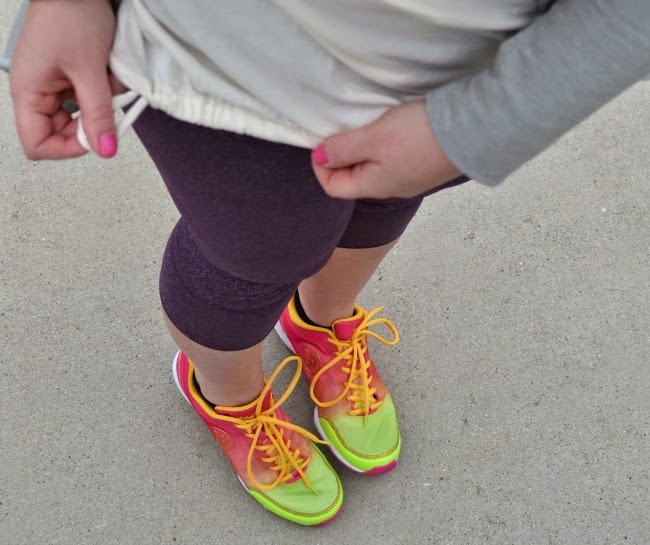 The pieces featured today are ranking among my absolute favorites and, of course, I'm still loving those neon sneakers. I brought this cardigan back from my last review because it's perfect for the warm/cool weather we're having right now. And it was a great opportunity to show you how the collection can be mixed and matched so perfectly. Get details on these pieces below, browse the entire collection here and take a peek back at my previous Zumba looks here and here! And right now you can get up to 70% off and free shipping on orders over $49 in the shop through May 26! This package from Zumba included the So Bootyful Capri, Burn It Up Bubble Racerback (sample), and the Lifted Mid-Level V-Bra. Also featured is the Long Cozy Up Cardigan and the Flex Classic Sneakers (reviewed in this post). These capris are very similar to the leggings I featured in my first review. They're fitted and tight but not so tight that they're uncomfortable. It's more of a "support" tight. The waist band is meant to be worn folded over which makes them very flattering. The cut and style is extremely slimming on your legs and thighs. My thighs are not small (don't we all have that complaint?! ), and I love the way these pants fit my shape. Not to mention, I love the gold logo detail! This tank is a spring/summer 2014 collection sample, but is made very similarly to this one. As you can see from the closeup above, the drawstring in the hem can be tightened or left loose. The material is very soft and flowy - two features I always look for in work-out tops. 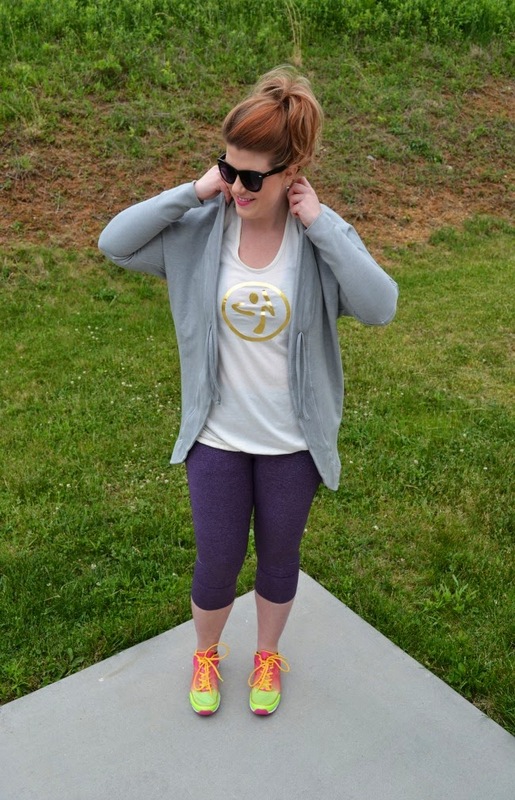 If you're a little self-conscious when it comes to work-out wear, this is a great piece! It's flattering and fits nicely to your shape without accentuating. 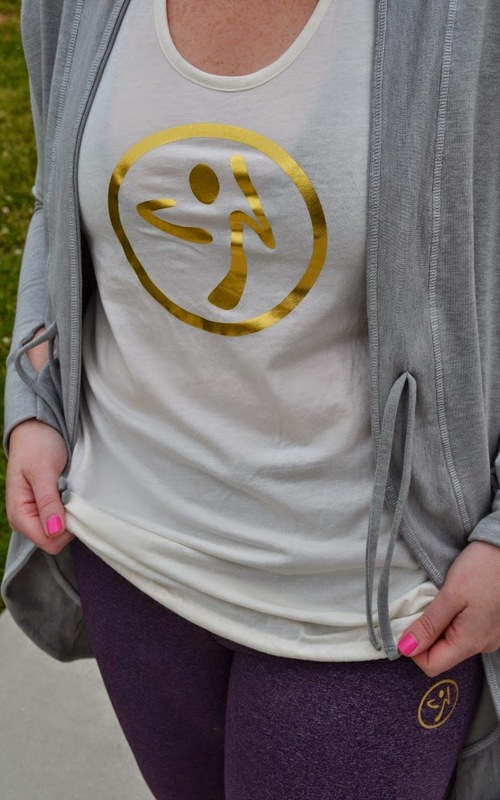 As with the capris, I'm obsessed with the gold foil logo. This collaboration has exposed me to so many great sports bra options. This style has a deep V front with a racer back. It gives great support and doesn't feel like a sports bra when you're wearing it. It's designed with Z-Dri technology to fight sweat while you work out - love this feature! Disclosure: This series is sponsored by Zumba apparel. I have been gifted the products featured in exchange for my review. All opinions are my own. Thank you for supporting the brands and companies that support my blog!